Lots of collectors like low-numbered notes. 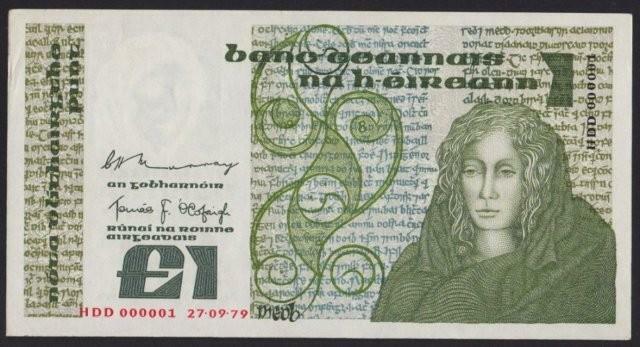 Irish low numbers notes, especially of the Lavery series and Ploughmans are quite rare. I haven't seen many. The hand-numbered terminator notes non-extended 100000 and 1000000 are even rarer! Serial numbers were extended from 100000 per prefix to 1000000 per prefix on Lavery notes as below. Prior to these dates prefixes changed at 100000 which was hand-set on the note. Higher denominations did not have their serial numbers extended. 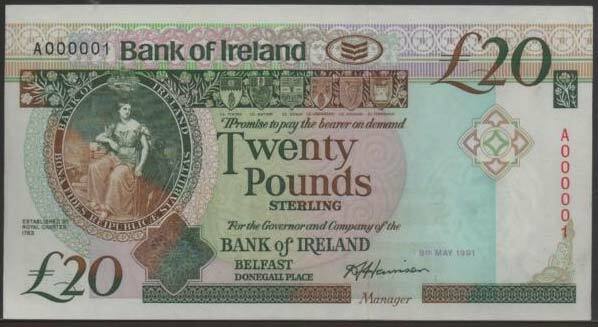 B Series Yeats £20 note replacement number 1. 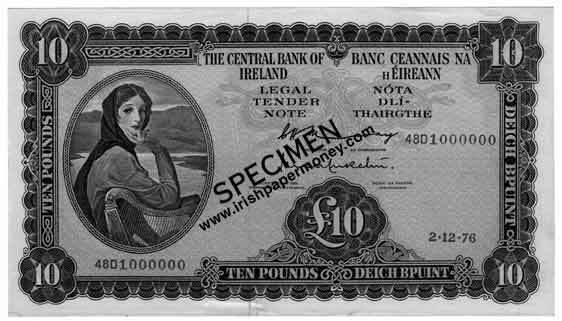 A Lavery 'Terminator' one million note. 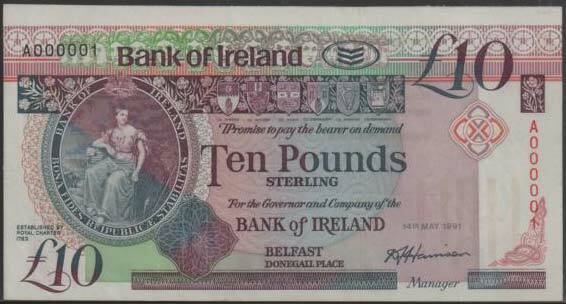 Central Bank of Ireland Ten Pounds 1976, Whitaker, Murray signatures. A Lavery 'Terminator' 100000 note. Early prefixes went up to 099999 with 100000 hand-set on the note. Later notes had the serial numbers extended to 1000000 per prefix. Ploughman 100000 notes were not hand-set. 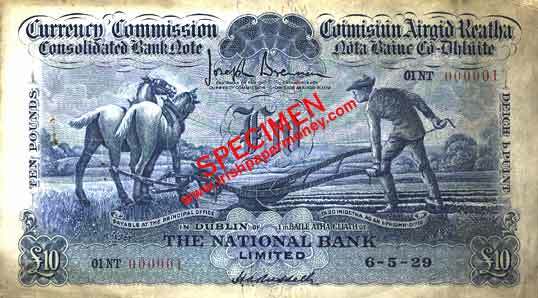 Central Bank of Ireland Ten Pounds 1952, Brennan, McElligott signatures. The first ten shilling note! 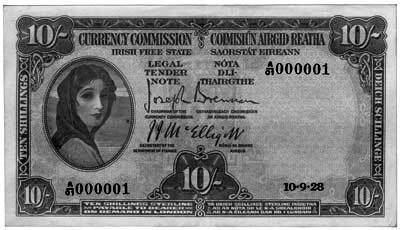 Currency Commission Irish Free State Ten shilling note, 1928. A nice example of a Lavery One Pound note number 000001. This is the first note printed with the date 23.5.69. £1 Lady Lavery number 1. 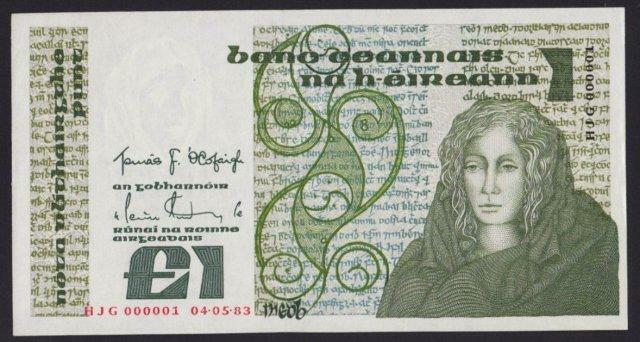 Here is a nice pair of Bank of Ireland notes, numbered 000001. The very first notes of the series depicting Queens University of Belfast on the reverse. 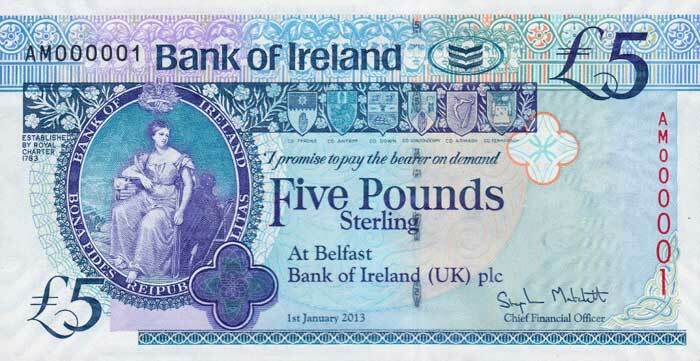 Here's another number 000001 note from Northern Ireland. 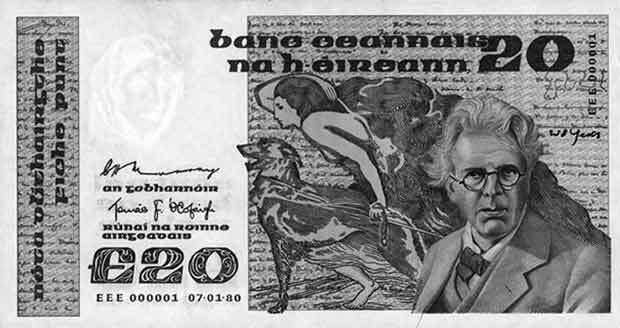 Bank of Ireland 5 Pounds 2013 number 000001. 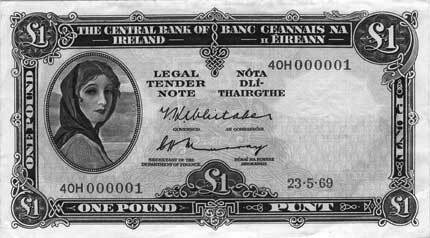 Here's another Bank of Ireland £1 note, number 1, from an earlier issue. Nice if you can get one! 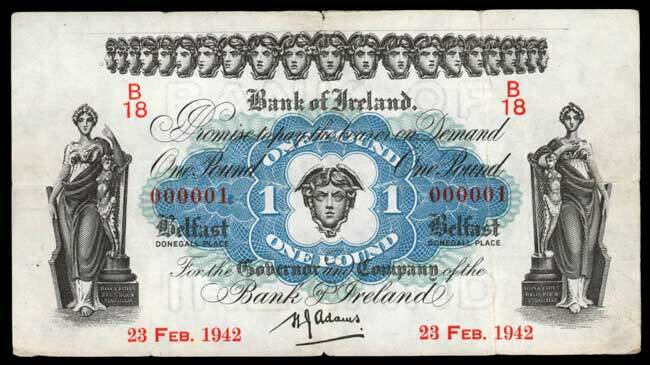 Bank of Ireland £1 note 23 Feb 1942, number B18 000001. 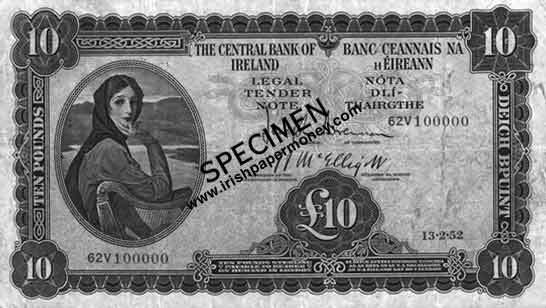 This Number 000001 note is interesting as it is the first Northern Ireland £1 note issued by the Bank of Ireland. That would be a very tasty note to have in one's collection! Here is a nice one! 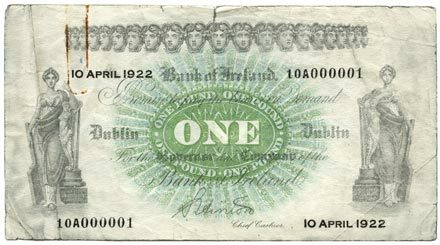 The very first small size Bank of Ireland £1 note printed for the new all-Ireland note design in 1922. This was the first major change to the format of the bank's notes since 1838.